Guido Seiler gave a lecture on “Wenn Dialekte Sprachen sind, dann ist Dialektkontakt Sprachkontakt” (If dialects are languages, then dialect contact is language contact) at the workshop “Sprachkontaktforschung – -explanativ” (Language contact research — explanatory) at the University of Augsburg, 14-16 April 2016. Guido analyzed the specific type of mixed dialect resulting from contact between Bernese German and Pennsylvania Dutch in Indiana. Jonathan Kasstan and Anita Auer organised a panel on “Exploring attitude and prestige in the ‘heritage language’ context: a cross-linguistic perspective” at the Sociolinguistics Symposium 21 in Murcia, 15-18 June 2016. Relevant powerpoint slides can be downloaded HERE. 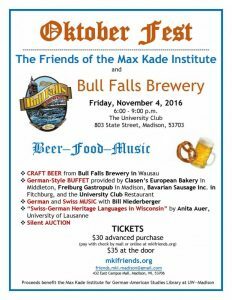 Anita Auer gave a talk on Swiss heritage speakers past and present at the Oktoberfest on 4 November 2016, organised for the Friends of the Max Kade Institute in Madison (Wisconsin). Guido Seiler gave a guest lecture on “Eine neue Sprache entsteht: Aktuelle Entwicklungen in der Sprachinsel des ‘Shwitzer’ (Indiana, USA) zwischen Isolation und Kontakt” at the University of Zurich (CH) on 6 December 2016. Anita Auer and Alexandra Derungs gave an invited talk about the Swiss Islands in North America project, and in particular their recent visit to New Glarus, at the Glarnertüütsch Stubete in Hotel Glarnerhof, Glarus (CH) on 29 January 2017. Guido Seiler gave a guest lecture on “Aktuelle Entwicklungen der Zwillingssprachinsel des ‘Shwitzer’ in Indiana (USA)” at the University of Bamberg (D) on 1 February 2017. Guido Seiler will give an invited talk on “Language structure as a mirror picture of social structure? The case of Shwitzer language of Adams County, IN”, as part of the workshop “People of Faith, Voices of Tradition: Germanic Heritage Languages among Christians and Jews”, at the Max-Kade Institute, University of Wisconsin-Madison (30 March-1 April 2017). Anita Auer will give a plenary talk on “Preserving Swiss Dialects in the Diaspora: The Social Life of a Wisconsin Language Island” at the Historical Sociolinguistics 2017 Conference at CUNY Graduate Center in New York (6-7 April 2017). Guido Seiler will give a talk on “Borrowing a grammar without speaking the language? The case of Amish Shwitzer”, as part of the panel on “New historical perspectives on non-dominant speakers as agents of contact-induced language change” at ICHL 2017 at the University of Texas at San Antonio, 31 July – 4 August 2017.